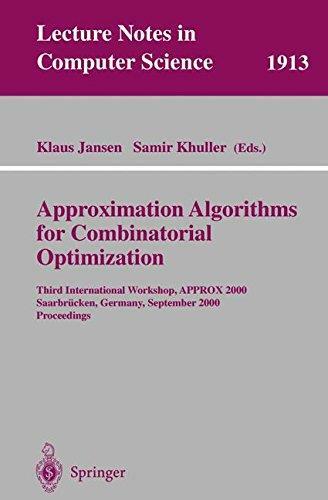 This book constitutes the refereed proceedings of the Third International Workshop on Approximation Algorithms for Combinatorial Optimization Problems, APPROX 2000, held in Saarbr?cken, Germany in September 2000. The 22 revised full papers presented together with four invited contributions were carefully reviewed and selected from 68 submissions. 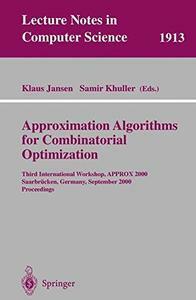 The topics dealt with include design and analysis of approximation algorithms, inapproximibility results, on-line problems, randomization techniques, average-case analysis, approximation classes, scheduling problems, routing and flow problems, coloring and partitioning, cuts and connectivity, packing and covering, geometric problems, network design, and various applications.